A fine, supple mix of long synthetic fibers and flash conveniently pre-wound onto a thin diameter stainless wire core, Enrico Puglisi's Anadromous Brush exhibits a brilliant pearlescent shine perfect for winding shimmery collars and bodies on salmon, steelhead and saltwater flies. 10" long with 6 brushes contained per pack. Great dubbing hair for Steelhead flies, Intruder flies, Tube flies. EP Sommerlatte’s UV Grizzly Foxy Brush come with six brushes per pack and is 3 inches in width. Each brush is grizzly barred with alternating colors of fox and EP fibers mixed. Easy to wrap and trim if needed. Baitfish patterns, steelhead and salmon flies, and saltwater streamers are all easy to create with Sommerlatte’s Grizzly Foxy Brush. EP Senyo Chromatic Brushes mix proven fly tying materials to make a wide fly tying brush for Steelhead Intruders, streamers and baitfish flies. Electric Ripple Ice Fiber by Hareline. Electric Ripple Ice Fiber is a bright colored synthetic option for dubbing loops, hackles and more. Think of Electric Ripple Ice Fiber as a synthetic Rhea or Ostrich fiber. 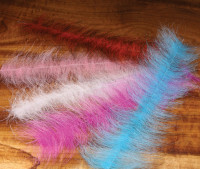 Add it to streamers or intruder patterns as hackle or on Intruders as a buildup bump. Grizzly Fibre is a barred synthetic winging material that is great for steelhead flies, salmon flies, trout streamers and of course saltwater patterns. It's a "light" material in the sense that it doesn't bulk up and will not hold water. Grizzly Fibre is a perfect winging material for so many flies! Girzzly Fibre is a no holds "barred" wispy winging material that we are finding all kinds of ways to accent our flies. Micro Barred Voodoo Fibers are 1/69" wide, about the same as flashabou. They are micro barred fiber to give a grizzly barred effect. Fibers are 8" long. Designed to emulate Rhea feathers, these 1/16th inch thick fibers synthetic tie in gorgeously to pulsate while swimming. - Swim and moves great, and lots of action to your Steelhead and Salmon Intruder patterns and Leeches.